The NBA Finals have arrived and for the fourth time in as many years, it’ll be the Golden State Warriors taking on the Cleveland Cavaliers. Join The Roar for live scores and coverage of Game 1 from 11am (AEST). Whether it’s the best thing for the NBA or not is up in the air, but after two seven-game conference finals series, the Cavs and Warriors are into the finals again. Cleveland will be looking to square the ledger of the finals up at two-all, but they are underdogs. Big underdogs. LeBron James is quite literally the only reason the Cavs made it into the big dance. They were struggling to beat Boston away from home during the Eastern Conference finals, but found a way to get it done after facing elimination twice. Without the concussed Kevin Love, LeBron – who has almost certainly cemented his status as the greatest player of all time – put up huge numbers, missing all of about 90 seconds across the two games to drag Cleveland into the finals. 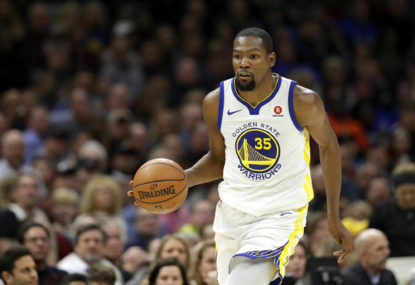 Doing everything on your own generally isn’t the way to win the NBA Championship though and the chance of him being able to beat the Warriors juggernaut four times in seven games – with four of them on the road – seems outrageously slim. Sure, he did it in 2016, but he had a slightly better team and got on a roll from 3-1 down in the series. Golden State didn’t get to the finals without their own problems though, with the side almost being brought undone in the Western Conference finals by the Houston Rockets. One would go as far as to say Houston should have actually qualified, which, on paper at least, would have set up a more intriguing finals series. In Game 6, on the road, Houston led by 17 at the end of the first quarter, before being mowed down in a 93-47 mauling across the last three quarters as Klay Thompson came up big. Game 7 was more of the same. The Rockets led by ten points at the halftime break on their home floor in Texas, before missing 27 straight threes to lose the game and allow Golden State to go through again to the biggest series in basketball. While Klay Thompson came up huge in Game 6, the form of Steph Curry and Kevin Durant, to go with the defensive intensity of Draymond Green, have guided the Warriors through. The return of an injured Andre Iguodala will only make them stronger for the finals series. The Warriors, at home, are going to dominate this series opener. The Cavs, on the back of LeBron, might have a few runs here and there, but all in all, this will be a drubbing from dub nation. Be sure to join The Roar for live coverage of Game 1 in the NBA Finals from 11am (AEST) and don’t forget to get involved by dropping a comment in the section below.